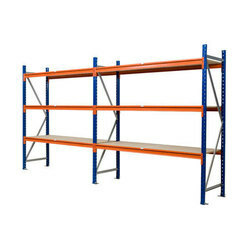 Leading Manufacturer of warehouse slotted angle rack, heavy duty warehouse racks, heavy duty warehouse storage rack, warehouse mezzanine rack and warehouse storage rack from Sonipat. Manufactured in accordance with the set industry norms and guidelines, quality of these Warehouse Slotted Angle Racks never diminishes. High load bearing ability and unmatched resistance to corrosion. 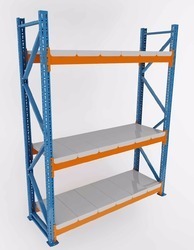 We are among the eminent manufacturers of Heavy Duty Warehouse Racks in the industry. The offered racks enable efficient space handling in industrial environments, enabling the customers to achieve high time and cost efficiency. Their sturdiness enables them to bear heavy loads, making them ideal for storing a wide range of items. Leveraging our vast industrial experience in this field, we are committed to offering a wide spectrum of Heavy Duty Warehouse Storage Rack. Additionally, we are offering these products at very affordable rates. Leveraging our vast industrial experience in this field, we are committed to offering a wide spectrum of Warehouse Mezzanine Rack. 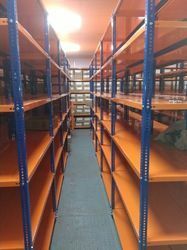 We are engaged in manufacturing Warehouse Storage Rack.